Interstate 405, one of the busiest freeways in this country, was shut down again for construction/demolition this weekend. Angelenos were warned to stay off the roads or use public transit. We live by the beach. The Cinerama film festival is across town in Hollywood. We took public transit. Redondo Beach was once a streetcar suburb of Los Angeles. A light rail line once ran diagonally across the LA metro area grid of streets that took riders directly from our neighborhood to downtown in less time than it takes today to drive on the freeway and in about half as much time as it takes on today's roundabout mass transit system. Grrr. Anyway, here we are waiting to transfer from the green line (an elevated train) to the silver line (a bus on a dedicated bus lane on the freeway and then on regular surface streets). Notice both TFN and Bad Dad reading on their kindles. And transferring from the silver line to the red line (subway).This is the best of the blurry photos that Bad Dad took. I'm carrying knitting in the white bag. Iris is wearing Simplicity 2689 (top) and Kwik Sew 2666 (pants) and I am wearing Simplicity 2938 (top) and Vogue 1247 (skirt). We watched the sole surviving print of The Wonderful World of the Brothers Grimm. Russ Tamblyn, the only actor to have worked in two cinerama films, regaled the audience with reminiscences about the experience and explained some of the technical difficulties from the actors' viewpoint. He sat a few rows behind us with several of his West Side Story costars, including Rita Moreno. The screening ran long because it was interrupted by technical problems. With three cameras and three aged strips of film, the likelihood of problems grew geometrically. During intermission, we looked at the special camera used for cinerama filming and spoke to the film editor for all of the cinerama films and the son of the inventor of the camera. Do you know the connection between cinerama and Cold War U2 spy plane photos? Stay tuned. BTW, the movie plays fast and loose with history. Listen to what University of Michigan's professor Eric Rabkin has to say about the Brothers Grimm. No, it's not quite like power yoga. I really don't need another online class, but Power Searching with Google doesn't take much time and the things I learned will save me more time in the future. The videos go very, very slowly and are suitable for my father in law. But, click the button at the top right that says "Text Version" and you will see a one page subunit transcript with slides that you can read very quickly. There will be about 5 subunits per week for six weeks. I thought that I was pretty good at searching, but I learned something new in Lesson 1.2, Image Search by Color. I work primarily on a laptop and the filter by color option is on the left side of the image search results, partially cut off at the bottom of my screen unless I scroll down. I never noticed that option before due to that usability problem. Let's use one of their examples. Suppose you are in the American Southwest and you find a fossil and want to identify it. 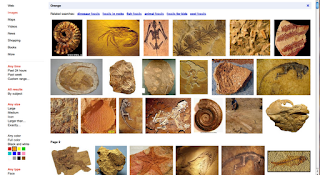 Look up fossils in Google Image Search. You will see lots and lots of them. Now filter by color, say the orange color of your sandstone. 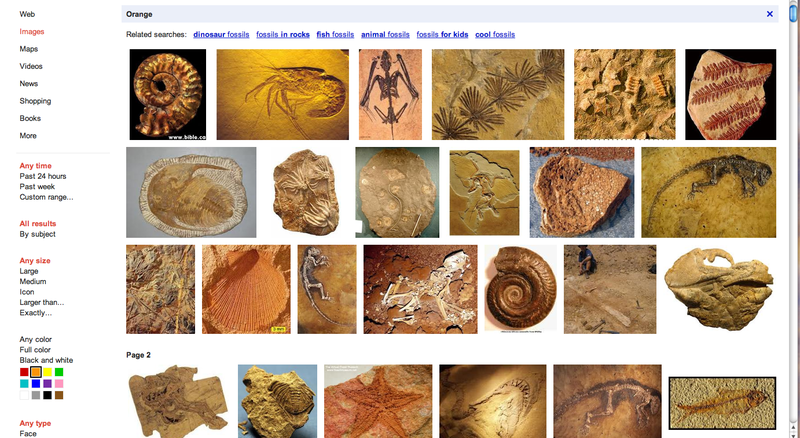 Wow, you've now eliminated irrelevant results and primarily have pictures of fossils found in orange stones! The example with Tesla is even more surprising. Read the lessons and do the activities. The activities .extend. the learning and show you more new tricks. Each week's lessons (and all subunits and activities) will only take 30-60 minutes. 60 minutes is if you fly off on an exploratory tangent. If you are sitting around, waiting for something, read a unit or two. You may learn something new and useful. 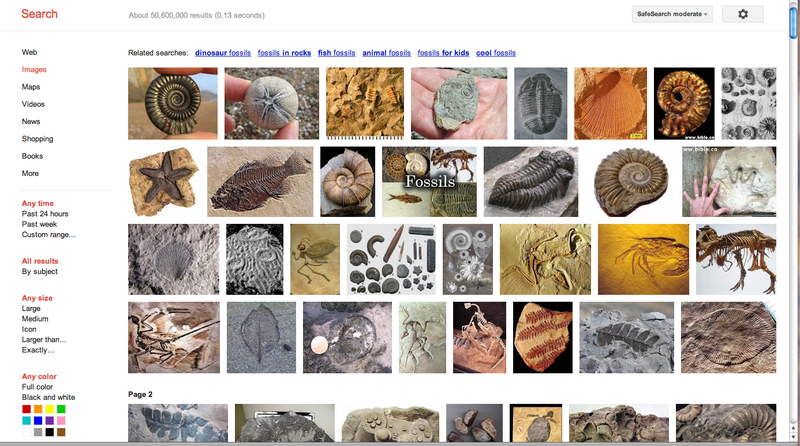 BTW, Yahoo also has an image search, but it is less sophisticated. Suppose you are tracking down people who have stolen your photos off your web site. 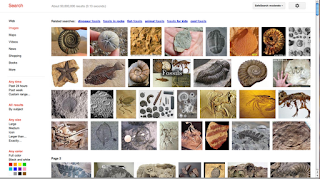 You can upload a version of your image to Google Image Search. (Click on the camera logo on the search bar.) Google will search through their indexed images for similar images, even if they have been resized and renamed. Google has indexed more web pages than images, but the size of their image collection is growing rapidly. Yahoo has fewer indexed images and cannot currently recognize images that have been resized or renamed. Image searches rely heavily on % color occurrence so your search may turn up images of unrelated material that has a similar color palette and ratio of colors. They also rely on meta-data like captions and tags. That's one of the ingenious things about Flickr, Picasa and Pinterest. They are providing a platform for imagery owners to collect metadata about their images for free! Do you use Style.com to view fashion show pictures? Have you noticed their Pin-It button on the top right? Pinning is a multi-step process. You can't save it until you have logged in (telling them who you are) .and. tagged the photo with a description. Over time, they can collect the frequency of tags of an image, or find images with specific tags; they can also filter by quality of tagger. (Are you a high-quality tagger with a high trust weighting?) All that can be collated and returned to the image source (possibly for a fee). Big data meets crowd-sourcing meets capitalism in the wild-west days of the internet. Mr. Campion knew that Max Fustian had killed Mrs. Potter as soon as he saw him that evening. From Death of a Ghost by Margery Allingham, Chapter 15. In other news, Iris came home from school with a right brain/left brain quiz. Just for kicks, Bad Dad and I also took the quiz. Brain dead and critical thinking, in which I took the online left and right brained quiz and the results skewed the other direction. Measurement error. Life has been busy and good chez BMGM, but not often blog fodder. If you are purely interested in sewing content, scroll to the end. There was no school last Monday because of Rosh Hashanah. 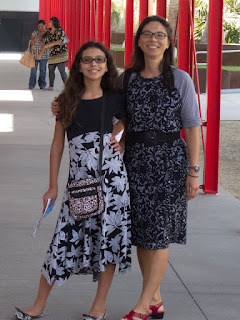 I took Iris and three of her friends to LACMA and lunch at Rosalind's in Little Ethiopia. The girls wanted to see the Egyptian display. I wanted to see the leather bound books in the Japanese area. Fortunately, Mike agreed to accompany the girls so I could sneak off alone. The books are amazing and well-worth visiting. But, the surprise is how well I planned the outing. I had forgotten that Mike learned to read hieroglyphics as a break from ARPANET programming and then traveled around Egypt. The kids enjoyed his company and all his stories as much as I do. * Ask Mr Protocol was a monthly column about internet protocols and security that ran for 15 years. There are two basic rules to security considerations of any sort, computerized or otherwise: 1) The effort put into security should be consonant with what you’re trying to protect, and 2) a steel front door does no good if the back wall of the house is missing. Or, putting it another way, security should be appropriately scaled, and it should be applied evenly. Sort of like a good coat of paint. There is nothing inherently good about security. It is a negative concept: it exists, in its entirety, for purposes of prevention. In a perfect world, the entire apparatus could go away and it would be unmourned. Most people never have to move beyond that. However, if one looks around, it isn’t hard to find folks who, as much as they might wish it, don’t fall in with what “most people” need. Take email. There are the people who send things via email that they’d rather not have read by people other than the intended recipients. Some of these people are working on sensitive technology in big-money start-ups, for example, or are exchanging email about contract negotiations, email that the people on the other side of the table would just love to read. Then there are the people who need to keep their email secret from the CIA, the NSA, the NRO, the FBI, the Trilateral Commission, the UFOs and all seven clones of Lee Harvey Oswald. No, really! Security isn’t in the eye of the beholder. It’s in the eye of the beheld. 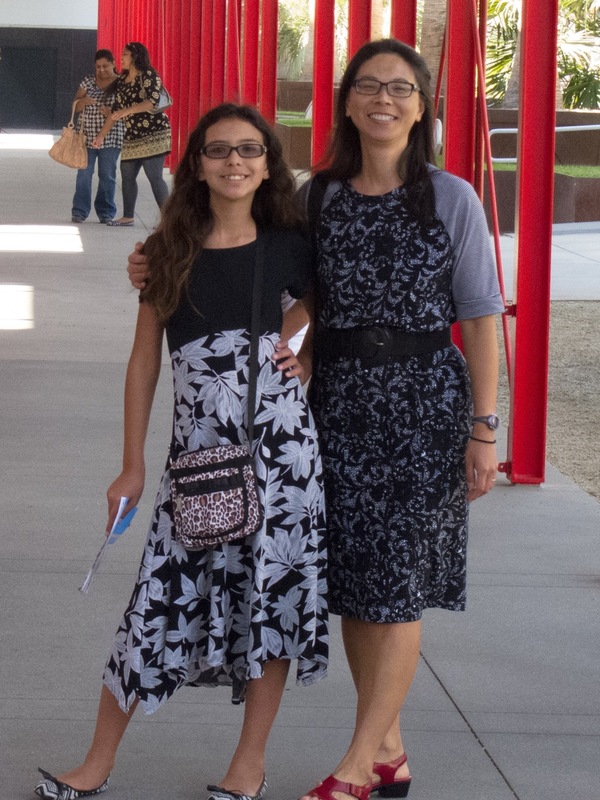 BTW, Iris is wearing Vogue 8936 and I am wearing a Frankenpattern with pieces from Vogue 1224 (skirt) and Kwik Sew 2852 (bodice). Yes, I did make Vogue 1224 straight up and will post pix and a review later. It's actually a yogurt container sitting in a sunny window. Dyeing deep blue colors is tricky, but heat helps promote dye uptake. I knew that the ultra-hot weather was good for something. Here's midnight blue in the dye pot. After a couple of washes, here's the Belgian linen yarn from Twist from the small dye pot set against undyed Belgian linen cloth the same color as the undyed yarn. Playing with color and texture on my worktable today. Thank-you presents can be tricky. After we stayed at the perfect cabin, we wanted to show our gratitude to the hosts and to the cabin. For instance, the furniture was too nice to set our mugs down without coasters. But we couldn't find any. Would a gift of coasters be interpreted as implied criticism? The cabin is a perfect getaway as it is. But, don't the neatly lined up mugs in the kitchen spelling out B.E.A.R. need companion coasters? And doesn't the shedding bathroom mat deserve a suitably blue and gold replacement? And then doesn't this interesting book with a bright yellow jacket deserve to be read while sitting (most definitely not in traffic) out on the deck? Iris and I stenciled the letters on simple IKEA cork coasters. She thought up the alternating color scheme. I told her that the yellow wouldn't show up against the natural cork background. She says that I just needed to use more coats of yellow. Harumph! Well, the blue Sharpie outlines fixed the contrast problem. The bath mat partially solved my SABLE problem with yarn. It used up 390 grams of odd balls of cotton and cotton blend yarns in a box under my bed. This is loosely based upon Absorba, the great bathmat pattern. I used two strands of cotton and size 10 needles instead of the 3 strands and size 15 needles in the pattern. It's still plenty cushy. I made two more Absorba variations. Artists have a tremendous soft spot for handmade things, don't we? Jennifer Larew, who writes The Blackwing Diaries, wrote about what drives her to create in Para-nimation. When I was launched on the Aardman/Dreamworks production "Flushed Away" in 2008 I went into the conference room to hear a pitch of the film and get my first assignment. Before they began the directors, David Bowers and Sam Fell, put a puppet of a character from "Chicken Run"-Fetcher the rat-into my hands. At that point it was going to be a stop motion, not CG, film. Looking at this little plasticine figure in his miniscule tatty clothes, charming, completely solid and three dimensional, was an inspiration; I just wanted to see him move-to act. Artists have a tremendous soft spot for handmade things, don't we? I'm a scientist, but I have a soft spot for handmade things, too. What about you? How do you characterize yourself and do you have a soft spot for handmade things? BTW, have you read the Sri Threads blog, which showcases Japanese Boro handcrafted goods? The objects and photography are inspirational. What kind of lives did their makers live? It must have been hard, but how did they find the time and energy to create, and to create so painstakingly beautiful everyday objects? 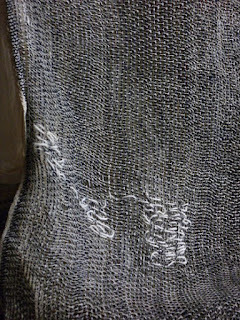 Detail of a mended Mojiri-oji.